Once again this year our Garden Party was at the beautiful MountainGate Country Club in Bel Air. 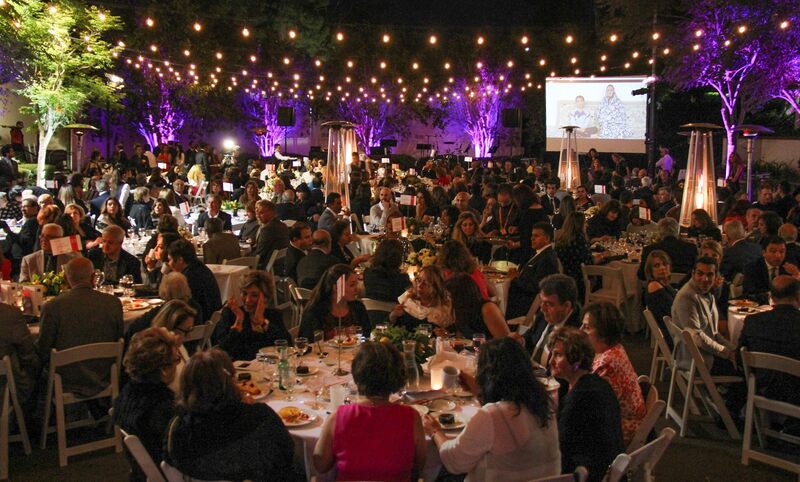 500 guests and supporters of KCIS children joined us on this beautiful night and showed their care and kindness with their presence and contributions. We raised $300,000 at this gala with the help of kindhearted sponsors — the money that will go to our 400 kids in Iran. With your help these kids will break the generational cycle of poverty through education. To our sponsors: You all helped change lives that night — on behalf of the kids thank you and well done. Rozhan has a loving capable parents who can take care of her here. We are trying to help with education of children in Iran who are very smart but their parents have financial challenges. We raised $300,000 at this gala with the help of kindhearted sponsors -- the money that will go to our 400 kids in Iran. With your help these kids will break the generational cycle of poverty through education. To our sponsors: You all helped change lives that night -- on behalf of the kids thank you and well done. Our annual gala (actually a garden party) is held at the beautiful Bel-Air Country Club. We prefer the serene natural setting of the outdoors better than the traditional ballroom of a hotel. Our beautiful hostesses greeted the arriving guests with glasses of champagne -- a pleasant start to a good night with friends and ..... for a beautiful cause. Mr. & Mrs. Kiani, our wonderful sponsors. Sponsored 5 children at the Gala. A very special thanks Amethyst aziz.. You both just shined at the Gala. Mr and Mrs Mohsen and Sally Dibaei. He is the chairman of the board of KCIS and she is one of the backbones of our gala. Every year they contribute most generously to the kids. This year $20,000. mir Dibaei LA Attorney, One our young generous sponsors with Ms. Sahar Kashani, also a dedicated KCIS sponsor and donor. Dr. Farhad Sigari and Sarvenaz have become big time supporters of kids education. Young lawyer Mr. Hamed Meshki is responsible for us being able to transfer money legally to Iran through OFAC license. Here with his beautiful wife and parents. Mr. Mohammad Gharavi & Jila Ajeli Kashef the founder of KCIS. Beautiful Haleh Hatami on the left. Dr. Bijan Motamed and his beautiful lady, Peyvand, KCIS long time dedicated sponsors. Here the beautiful Niaz Kasravi. Three beautiful souls and ardent KCIS supporters. We may raise the money here but the lady responsible for overseeing that the funds are spent wisely on the kids in Iran is Mrs Behjat Daroudi board member of "Anjomaneh Yaraneh Danesh va Meher" --AYDM, our sister organization in Iran. Thank you for your support of KCIS. Thank you , Bita Daryabari & Catherine Daravi for supporting our cause on top of the amazing work you do in Pars Equality Center. In the middle the amazing Fereshteh Tavakoli who works miracles for MAHAK and kids with cancer. On top of that she supports our cause too. On her left. Ms. Felor Asadi, another lovely long time sponsor. In red the beautiful and dynamic Mariam Khosravani the force behind Iranian American Women Foundation (IAWF). She is also on the advisory board of KCIS. Just an amazing woman. Left is Mojagn aziz very active in Persian community. 2nd lef is Ms. Shahla Sohi, a KCIS new family member. Shahla joon, welcome to KCIS family members. Mrs. Parvin Arasteh not only runs her own wonderful foundation for education of kids in Iran she also supports ours. On the right Payam Banazadeh a KCIS volunteer both when he was a NASA engineer in LA, and now that he has finished a master degree at Stanford and starting his own company. On the left the stunningly beautiful Berkeley educated Nika Shv and a new KCIS supporter. Love this couple. Dr. Firouz Naderi with Cheshmak Amirani , one of our elegant volunteers with Negar Doroudian, newly KCIS sponsor. Fariba Simab Hezar. KCIS Sponsor. On the right Sherry Nahid who coordinated the KCIS Gala and hosted us in her beautiful home for countless Sunday breakfasts as we worked to stage this gala. Tall, beautiful lady on the right is Dr. Roya Yazdani, a long time sponsor. On the far left, Dr. Farnoosh Mehr another lovely sponsor of KCIS. Left couple- Shahryar Meshkaty and Nooshin Meshkaty generous donor and sponsor of KCIS for the last few years. Right couple John and Mandana another lovely donors of KCIS. Vandad Massahzadeh & Arezoo Koochakan -- they spread cheers and good music whereever they go. The handsome Ardavan Mofidi on the left is a KCIS supporter and the nephew of Shirazi sisters. Piran Zarifian produced an emotional 3 minute movie about the dreams and aspirations of our young kids in Iran. Brought tears to many eyes that night. Here with his beautiful fiance' the graphic artist designer Niki Mihanyar. Goli Chitsaz, Is a lovely dedicated KCIS volunteer as event planner here with Sherry Nahid another dedicated volunteer. Both do a great job to make KCIS yearly Gala successful. Immigration Judge Ashley Tabaddor with Dr-Paris Noori. Ms. Behjat Daroud, Board member of KCIS Sister Organization (AYDM) in Iran with Ms. Sally Dibaei and Sherry Nahid, both dedicated KCIS volunteers. Mahsa Shoeleh a very generous artist, who has always donated her Art to support Children's education. Her lovely supportive husband, Dr. Ali Maki. Bahman Zakeri and his beautiful Leila Yeganeh. Generous supporters of KCIS. Bahman Zakeri CEO of Xivic Inc. & Pedram are planning to upgrade KCIS Website to next level. Not only that, but generous donors to KCIS. Two lovely and beautiful sisters Anahita and Keemia Ferasat. Shahryar Meshkaty and Nooshin Meshkaty,( NASA/JPL Engineer) - KCIS Sponsors. On the right the brilliant Rostam Zafari who is a 20 year old writer, poet, wrestler, "shahnameh" buff and entrepreneur starting his own educational company Mystro. Second from left Sudi Tehrani who has been generously sponsoring KCIS kids for several years. In the middle Mr. John Larsen who came to our event for the first time time this year and became a kids sponsor. Thank you John. On the left Shaahin Espahbodi one of the best modern architects in America. On the right Sudi Farokhnia a dedicated volunteer of KCIS, taking care of fundraising finance every year - full of Passion. with our lovely sponsors - Felor Asadi and Fereshteh Tavakoli. In the middle,Elnaz Mir our volunteer coordinator - recently joined KCIS and did a great job to bring more than 30 volunteers together to support our 2016 Gala. Firouz Naderi -- a KCIS Board member. And where would we be without the help of our KCIS most amazing volunteers. Our guests socialized with friends, enjoyed appetizers and drinks in the beautiful Bel-Air country club before sitting down to dinner and taking in the program. Young handsome and generous: on the right, long time KCIS donor and sponsor Dr. Bijan Bam Motamed & his lovely wife Peyvand Malaksaidi - . On the left KCIS donor, the newly engaged Dr. Hooman Melamed here with his beautiful fiancee. Touraj Rahimi, KCIS sponor, Sima Melody Mofidi KCIS sponsor, Mona Mofidi and Atefeh Sharifan. Mrs. Forough Hosseini (Niki's aunt) a major philanthropist and supporter of many homeless kids in Florida (and vice chairwoman of the board of PAAIA) generously bought a table that night at the KCIS gala. She is also sponsor of a two KCIS kids. Forough jan you have a heart of gold. The real dessert that night was a sense that you are changing some child's life in Iran. The start of the program was heralded with beautiful sound by this group..
Our master of ceremony -- the unique entertainer with her own unique signature Ms Ziba Shirazi. The music theme for the night was jazz. On Base Sezin Ahmet Türkmenoğlu. On drums Cristiano Novelli Silva. Volunteers called to go on the stage. Our volunteers take the stage to be recognized. Payam and Leila the young faces of KCIS tell the crowd what we are all about. Mrs. Behjat Daroudi from Iran told the crowd how they care for the kids. Piran Zarifianproduced the emotional movie "the desert flowers" shown that night. The movie "desert flower" alludes to the fact that much like beautiful desert flowers that bloom, wilt and die without anyone there to witness their existence, these young kids if not nurtured and cultivated live an unnoticeable lives. Lets acknowledge and embrace them. Be witness to their passing through the Earth. Through education let their lives count. Jila Ajeli Kashef takes to the stage to solicit funds from the KCIS supporters. Jila beamed every time someone raised their hand to make a pledge. Someone must have made a large pledge!! A volunteer collecting a pledge envelope from Dr. Manijeh Javaheri, a generous sponsor of 13 children. A volunteer collecting a pledge envelop. Ziba delighted with a pledge. Hey I got a pledge here!! Volunteers giving pledge envelopes to Ziba for announcement. Payam Banazadeh announcing a pledge from a KCIS sponsor. These young ladies waiting to distribute flags each with a name of a child in Iran looking for a sponsor. Each flag represents a child waiting to be sponsored..
Dr. Hojr Sedaghat-Pisheh walks up to the podium with the biggest surprise of the night. Hojr and his fellow Googlers used a matching funds program at Google to raise ~$50,000 for the KCIS kids. Hojr please convey our immense gratitude to your colleagues -- and of course to you for spear heading this. ...... At the end she managed to raise some $300k for the kids that night ........ Thanks to the generosity and kind hearts of the KCIS sponsors. Thank you Michael Saei for coming and bringing with you some of your Farhang Foundation friends. Farhang has made such an impact in Los Angles introducing the Iranian culture to a broad audience. Thank you all for contributing generously to the kids of KCIS. Mr. Ali Razi Chair of the Farhang Foundation. An Amazing organization with lasting impact promoting Iranian culture. Their motto: We have to, after all it is our FARHANG. Dr. Bijan Bam Motamed, a long time sponsor and Sponsor of KCIS and his friend, Dr. Homan Hooman Melamed, also another KCIS supporter. In the middle the ever beautiful and elegant Dr. Roya Dehghan Ali Yazdani, a long time supporter of KCIS. Amethyes and Hamid Kiani, KCIS new family members. kindly sponsored one child per each households members. Welcome to KCIS family. Beautiful Dena Rad, KCIS Sponsor with her lovely friend Hasti Ershadi with a new guest. Dr. Farhad Sigari and his beautiful wife Sarvenaz Eskandari Sigari. long time KCIS sponsors. Thank you for your generous contribution to the kids. — with Sarvenaz Eskandari Sigari, Sally Dibaei and Farhad Sigari. Mansour Farahanirad and his lovely wife Farzaneh Espandiary, big supporters, sponsors and donors of KCIS with Mehrnoosh Mazarei, the author of Mina's Revolution. Nooshin Meshkaty, Mandana Soleimani and John, KCIS donors and art lovers. Ms. Firouzeh Afsharnia, KCIS supporter. We were lucky that she was back from Africa only few days before the Gala. Thanks for making it and your generous contribution Firouzeh jon! Dr. Roya Dehghan Yazdani, long term KCIS sponsor. The student Roya has sponsored "Jasmin" has been with us since she was in "Dabestan" and now she is studying chemistry at University in Tehran. Thank Pouria Abassi and friends for your support of the kids and sponsoring a table. Our beautiful Jila Ajeli Kashef the founder of this amazing organization. Ahmad Shakeri, new KCIS friend. Mehrnoosh Kianpour, A very long time KCIS sponsor. She is a writer and her recent Novel - Mina's Revolution.- is been sold at the Gala to support children's education. Sara Pisheh, an beautiful artist came from Northern California and supported KCIS with her beautiful art work and hand made jewelries. THANK YOU SARA JOON! A young man on the rise. And civic minded. Ray Hashemian, friend and supporter of KCIS and handsome husband of Atoosa joon! Ms. Homa Sarshar a generous and steady supporter of KCIS. She is generous with her radio program promoting this worthy cause ....... and always showing up and contributing funds. This stylish couple is expecting their first child ...... its a boy!! Ali jan happy fathers day. Mr. Reza Zafari, a generous sponsor of KCIS with his brilliant nephew "Cyrus Nury " and cousin "Rostam Zafari, another genius young Iranian. Mahsa Shoeleh, a dedicated supporter of KCIS has been donating her art and her heart to support Keep Children In School Foundation - KCIS. Mehrnoosh Mazarei, the author of Mina's Revolution, kindly donated the sales of her books at the Gala to Children's education. You can find her book on Amazon. Dr. Foujan Zeini and Sam Changizi, KCIS sponsor Left couples: Mr. Hamid and Amethyst Kiani. KCIS sponsors. Shahla Etedali, KCIS active board member, an artist who coordinates KCIS Gala's art work every year. Mehrnoosh Kianpour, Graphic artist and very dedicated KCIS volunteer Lili Mehrabi, KCIS sponsor. Roshi jan thank you for your support. Love these three sisters. If you have not had one of their spectacular Sunday brunches ..... well more for me. So good to have you all here. Thanks for your generous Support. The Stylish and generous Mr. Abdi Tavakoli in the middle. A long time KCIS supporter. Well done Jila jan -- the rock of KCIS. Interested in attending this year's event?